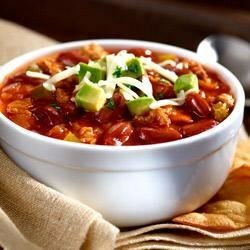 This is my go to lunch over the winter months when I want to eat something warm, satisfying, and delicious. It is packed with flavor, but won’t make you feel too heavy by the time you’re finished a bowl. I featured this recipe on my “Healthy Super Bowl Eating” news segment on WJZ weekend morning edition. Try it out for your next potluck! Each serving includes: 257 calories, 23g carbohydrates, 21g protein, 9g fat, and 8g fiber. Add onion, carrots, and celery and cook until softened, about 7-minutes. Add ground beef and break up into crumbles with a wooden spoon. Continue cooking until beef is browned and mostly cooked. Add tomatoes and their juice, salsa, water, and apple cider vinegar. Bring chili to a boil and then reduce heat to a simmer, mostly covered with a lid for 45-minutes. Serve warm- top with additional fixings of your choice!